If you rent a storage unit, you have an easy solution for putting away your suitcases and bags post travel. If not, and if you have other stuff taking up space, you might want to consider getting yourself a small unit. Though you might think you don’t need it, you’ll be surprised at how much more breathing room you’ll have around the home. Moishe’s Self Storage offers smaller units perfect for luggage storage at both our Bronx and Queens locations. Safe, secure and affordable, our units also come with free pick up when you commit to at least three months of storage! You know that space between the top of the cabinets and the ceiling? The one you never use? Well, you can put your suitcase up there and if it’s an attractive suitcase it could even look like a decorative item. It’s easy to slip a suitcase or a bag under the bed. If you have room, this is an obvious solution. If your bed is too low you might consider bed risers. 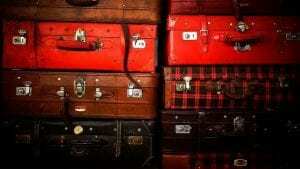 Stack several hard suitcases, especially pretty ones, and you got yourself a nightstand, or a side table. You can also use them as storage when not traveling. Another obvious place to store luggage is inside the closet. Once again, you can fill the contents of the bags with items already in the closet, essentially freeing up room for your bags. You can also pack smaller suitcases inside your large ones. If possible we like having our large furniture pieces, like couches, a little bit away from the wall. If you’re like us, use that space to slide in a suitcase or two. When purchasing luggage, try to pick out cases with smaller ones that can nest inside. When suitcases can be stored inside one another, it increases your storage capacity!